The first photograph of the Moon was reportedly taken by French photographer Louis Daguerre, but according to a contemporary it was unfocused and was lost in a fire shortly afterward. G. Neujmin discovered asteroid #814 Tauris. 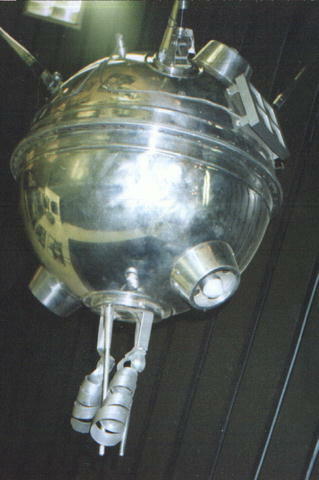 USSR launched Luna 1, the first spacecraft to leave Earth's gravity, and the first to fly by the Moon. It was also the first spacecraft to enter solar orbit. NASA's Mariner 9 began mapping Mars after the global dust storm subsided which started on 22 September 1971 and had enveloped the planet since its arrival. Mariner 9 was launched 30 May 1971 on a 398 million km direct ascent trajectory to Mars. A planned midcourse maneuver was executed on 5 June. Mariner 9 arrived at Mars on 14 November 1971 after a 167 day flight. A 15 minute 23 second rocket burn put the spacecraft into Mars orbit, making Mariner 9 the first spacecraft to orbit another planet. The insertion orbit had a periapsis of 1398 km and a period of 12 hr, 34 min. Two days later a 6 second rocket burn changed the orbital period to just under 12 hours with a periapsis of 1387 km. A correction trim maneuver was made on 30 December on the 94th orbit which raised the periapsis to 1650 km and changed the orbital period to 11:59:28 so that synchronous data transmissions could be made to the Goldstone 64 m Deep Space Network antenna. The Mariner Mars 71 mission was planned to consist of two spacecraft on complementary missions. Mariner 8 was to map 70% of the Martian surface, and Mariner 9 was to study temporal changes in the Martian atmosphere and on the Martian surface. The launch failure of Mariner 8 forced Mariner 9 to combine the mission objectives of both. For the survey portion of the mission, the planetary surface was to be mapped with the same resolution as planned for the original mission, although the resolution of pictures of the polar regions would be decreased due to the increased slant range. The variable features experiments were changed from studies of six given areas every 5 days to studies of smaller regions every 17 days. Imaging of the surface of Mars by Mariner 9 was delayed by a dust storm which started on 22 September 1971 in the Noachis region. The storm quickly grew into one of the largest global storms ever observed on Mars. By the time the spacecraft arrived at Mars, no surface details could be seen except the summits of Olympus Mons and the three Tharsis volcanoes. The storm abated through November and December, and normal mapping operations began. The spacecraft gathered data on the atmospheric composition, density, pressure, and temperature and also the surface composition, temperature, gravity, and topography of Mars. The Mariner 9 mission resulted in a global mapping of the surface of Mars, including the first detailed views of the Martian volcanoes, Valles Marineris, the polar caps, and the satellites Phobos and Deimos. It also provided information on global dust storms, the triaxial figure of Mars, and the rugged gravity field as well as evidence for surface aeolian activity. A total of 54 billion bits of scientific data were returned, including 7329 images covering the entire planet. After depleting its supply of attitude control gas, the spacecraft was turned off on 27 October 1972. Mariner 9 was left in an orbit which should not decay for at least 50 years, after which the spacecraft will enter the Martian atmosphere. NASA's Stardust Mission spacecraft passed within 236 km (147 miles) of comet Wild 2. Asteroid 2014 AA, a small Apollo near-Earth asteroid roughly 2-4 meters in diameter, entered the Earth's atmosphere and struck the planet approximately 21 hours after it was discovered.